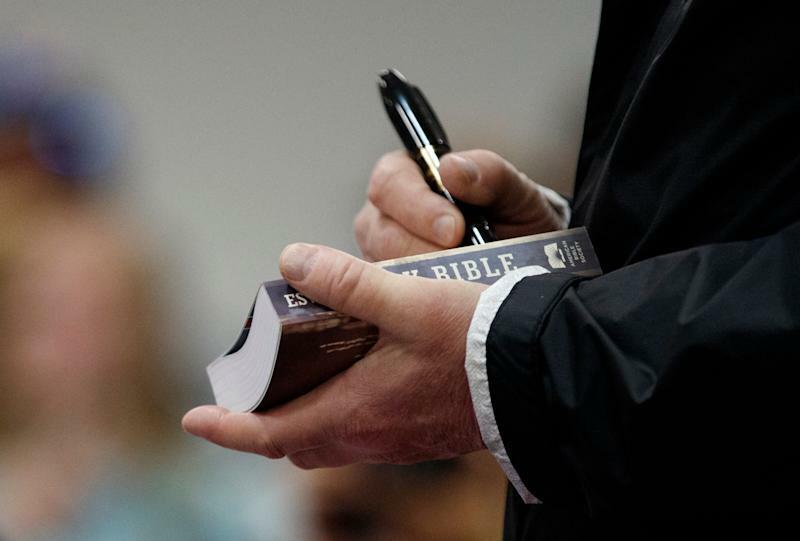 Touring the area where a violent tornado touched down earlier in the week, President Trump signed Bibles for supporters who gathered to see him at a Baptist church in Opelika, Ala.
A local television reporter, Sally Pitts, posted video of the visit. Ada Ingram, a volunteer at the church, said Trump signed several hats and Bibles, and praised the president for taking the time to travel to Alabama. Twenty-three people were killed Sunday after an EF4 storm laid waste to the rural Alabama countryside. While still robust, Trump’s support among evangelical voters has dipped in recent months. A Marist poll released at the beginning of December found 73 percent of white evangelicals approved of the job he was doing. Six weeks later, the same polling organization found that the number had dropped to 66 percent. Trump has long courted the evangelical vote, proclaiming in a 2015 interview that the Bible is his “favorite book,” while declining to identify his favorite verses. White House press secretary Sarah Sanders made headlines in January by proclaiming that Trump’s election was a matter of divine intervention. “I think God calls all of us to fill different roles at different times and I think that he wanted Donald Trump to become president, and that’s why he’s there,” Sanders said in an interview with CBN’s David Brody and Jennifer Wishon. At his rallies and speeches, the president is often asked to sign a variety of items, including Bibles and copies of his second-favorite book, “The Art of the Deal,” which he wrote.